Coffe cherry tea or cascara contained the compound of polyphenol class such as tannin, flavanol, flavan-3-ol, hydrazine acid, antosianin. The compound is very sensitive to oxygen and light because it is easily oxidized. Microemulsions can control both the active ingredient and can protect the active component from undesirable oxidation. Mikoemulsions is composed of water, oil, and food surfactant. Vegetable oil sources that can be applied in microemulsion are coconut oil and palm oil. The addition of cascara extract to microemulsion is expected to provide functional value of microemultion. However, the addition of cascara extract in microemulsion formulation affected the stability of microemulsion system. The objective of the research was to determine the effect of oil and cascara to stability of microemulsion, content of polyphenol and the antioxidant activity of microemulsion. The result showed that the kinds of oil variation given significantly effect for the microemulsion stability. The palm oil resulted the higher absorbance than coconut oil. The concentration of cascara extract had significantly effect for the microemulsion stability. The variation of cascara extract increased the absorbance value and significantly effect to the polyphenol total and antioxidant activity. YUWANTI, Sih; LINDRIATI, Triana; ANGGRAENI, Renny Dwi. STABILITAS, TOTAL POLIFENOL, DAN AKTIVITAS ANTIOKSIDAN MIKROEMULSI EKSTRAK CASCARA (TEH KULIT KOPI) MENGGUNAKAN MINYAK KELAPA DAN MINYAK KELAPA SAWIT. JURNAL AGROTEKNOLOGI, [S.l. ], v. 12, n. 02, p. 184-195, dec. 2018. ISSN 2502-4906. 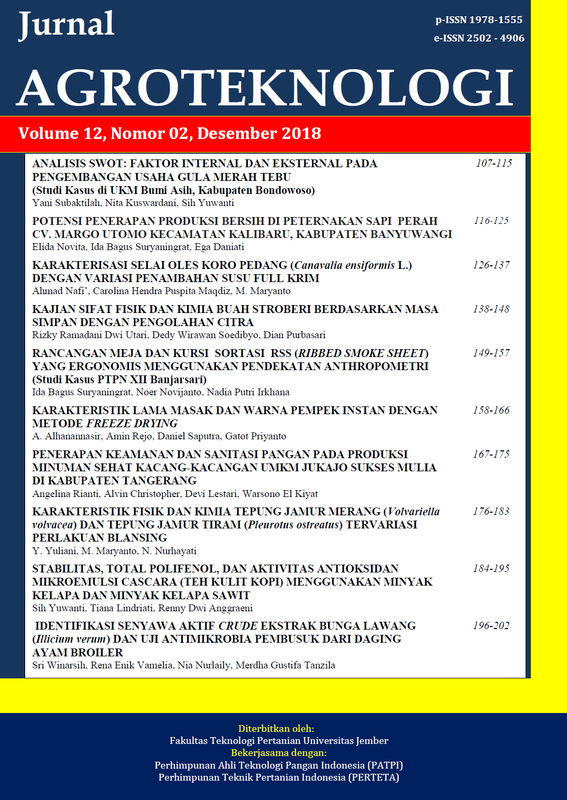 Available at: <https://jurnal.unej.ac.id/index.php/JAGT/article/view/9312>. Date accessed: 23 apr. 2019. doi: https://doi.org/10.19184/j-agt.v12i02.9312.